David Kirkpatrick Este Bruce (February 12, 1898 – December 5, 1977) was an American diplomat, intelligence officer and politician. He served as Ambassador to France, the Federal Republic of Germany, and the United Kingdom, the only American to be all three. Bruce was born in Baltimore, Maryland, to William Cabell Bruce and Louise Este (Fisher) Bruce (1864–1945). One of his three brothers was James Cabell Bruce. He studied for a year and a half at Princeton University. He dropped out to serve in the United States Army during World War I. At parental insistence, he then attended the University of Virginia School of Law (1919–1920) and the University of Maryland School of Law (1920–1921) without taking a degree before being admitted to the Maryland bar in November 1921. Brucee served in the Maryland House of Delegates (1924–1926) and the Virginia House of Delegates (1939–1942). During World War II, Bruce headed the Europe branch of the Office of Strategic Services (OSS), a precursor to the Central Intelligence Agency (CIA), which was based in London and coordinated espionage activities behind enemy lines for the United States Armed Forces branches. Other OSS functions included the use of propaganda, subversion, and post-war planning. He observed the invasion of Normandy landing there the day after the initial invasion. After leaving the OSS at the end of World War II, and before entering the diplomatic field, in 1948–1949 David Bruce was with the Economic Cooperation Administration which administered the so-called Marshall Plan. It was during this time that David Bruce and his new 2nd wife became an early member of the informal Georgetown Set within D.C.
Bruce, as a member of the new President's Board of Consultants on Foreign Intelligence Activities, wrote a secret report on the CIA's covert operations for President Dwight D. Eisenhower in 1956 that was highly critical of its operation under Allen Dulles's leadership. 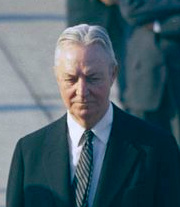 He served as the United States Ambassador to France from 1949 to 1952, United States Ambassador to West Germany from 1957 to 1959, and United States Ambassador to the United Kingdom from 1961 to 1969. He was an American envoy at the Paris peace talks between the United States and North Vietnam in 1970 and 1971. Bruce also served as the first United States emissary to the People's Republic of China from 1973 to 1974. He was the ambassador to the North Atlantic Treaty Organization from late 1974 to 1976. Bruce served as the Honorary Chair on the Board of Trustees of the American School in London during his diplomatic career in the United Kingdom. On May 29, 1926, Bruce married Ailsa Mellon, the daughter of the banker and diplomat Andrew W. Mellon. They divorced on April 20, 1945. Their only daughter, Audrey, and her husband, Stephen Currier, were presumed dead when a plane in which they were flying in the Caribbean disappeared on January 17, 1967, after requesting permission to fly over Culebra, a U. S. Navy installation. No trace of the plane, pilot, or passengers was ever found. Audrey and Stephen Currier left three children: Andrea, Lavinia, and Michael. He married Evangeline Bell (1914–1995) on April 23, 1945, three days after his divorce. They had two sons and one daughter, Alexandra (called Sasha). Alexandra died under mysterious circumstances (possibly murder or suicide) in 1975 at age 29 at the Bruce family home in Virginia. Bruce purchased and restored Staunton Hill, his family's former estate in Charlotte County, Virginia. He died on December 5, 1977 of a heart attack at Georgetown University Medical Center. Bruce received the Presidential Medal of Freedom, with Distinction, in 1976. The David K.E. Bruce Award was established in 2007 at the American School in London. Bruce wrote a book of biographical essays on the American presidents originally published as Seven Pillars of the Republic (1936). He later expanded it as Revolution to Reconstruction (1939) and again revised it as Sixteen American Presidents (1962). ^ David Kirkpatrick Este Bruce; Nelson D. Lankford (January 1991). OSS Against the Reich: The World War II Diaries of Colonel David K.E. Bruce. Kent State University Press. p. 35. ISBN 978-0-87338-427-8. ^ Tim Weiner, The Legacy of Ashes: The History of the CIA (London: Allen Lane, 2007), p. 133. ^ "David Bruce, 75, Selected To Head Office in Peking". The New York Times. March 16, 1973. Retrieved 2009-12-08. President Nixon announced today that he had recalled Ambassador David K. E. Bruce from retirement to head a United States liaison office in Peking. ^ a b School Web site Retrieved 2010-02-20. ^ a b Pitz, Marylynne (November 15, 2009). "Ailsa Mellon Bruce's artworks part of Carnegie collection". Pittsburgh Post-Gazette. Retrieved 2009-12-08. In 1926, the beautiful, reserved and stubborn young woman married David K. E. Bruce, a talented lawyer and the son of Maryland Sen. William C. Bruce. For wedding presents, A.W. Mellon gave his daughter a pearl necklace valued at $100,000 and a 200-acre estate in Syosset, Long Island. ^ "U.S. envoy David Bruce is dead at 79". Chicago Tribune. December 6, 1977. Retrieved 2009-12-08. David K. E. Bruce, a veteran American diplomat who served in a variety of posts including mainland China, died of a heart attack Monday at Georgetown University Medical Center. He was 79. Lankford, Nelson D. The Last American Aristocrat: The Biography of David K. E. Bruce, 1898–1977 (1996). Lankford, Nelson D., ed. OSS against the Reich: The World War II Diaries of Colonel David K. E. Bruce (1991). David K. E. Bruce's archives at the "Fondation Jean Monnet"